Do you have a contemplative education program, center, or initiative on your campus that you would like to promote to fellow participants (faculty, staff, students) at our Annual Conference? We’ve created this opportunity (during our conference Poster Session) to help spread awareness of degree and certificate programs, organizations, and centers dedicated to contemplative practices in higher education. Table space is first-come, first-served, and can be requested through Friday, September 30th. 10/1/16: The request period has now closed. When and where is the Program Fair? Saturday, October 8, 2016, at 1:00-2:00pm in the UMass Student Union Ballroom. 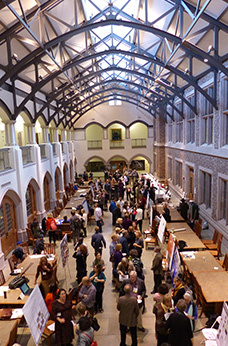 The Program Fair happens in the same room, at the same time, as the Poster Session. You will be able to leave materials set up in the room until 8:00pm Saturday night. Who is eligible for a table? This event is intended for representatives from degree-granting and certificate programs, centers, and academic organizations and initiatives that incorporate contemplative approaches and practices in their work. How much space will I have to work with? Plan for a 2′ x 4′ table space (and a chair). You can bring any materials you wish that will fit on the table. We plan to place the tables along a wall, but we cannot guarantee access to a power outlet. There is wifi in the building. When is the request deadline? You must request a table by Friday, September 30th, at 12:00 pm/Noon ET. Space is limited and we may not be able to accommodate all requests. How do I request a table? Email Maya Elinevsky, Conference Coordinator, at maya@contemplativemind.org with a description of your program and a link to your website. We will confirm your table space as soon as we can after you submit your request, or no later than Monday, October 3rd. If I don’t get a table, can I still leave flyers and other information for participants? Yes, there will be an unattended info table at the conference where you can leave your materials for people to take, but the Program Fair is an opportunity for you to be present to discuss your work with fellow participants.